The formation of demand in the music industry is highly uncertain and volatile. Since the music industry is a dynamic industry where quality, uncertainty and oversupply prevail, it is difficult to predict which product will gain success. However, to overcome these uncertainties, consumers will base their decisions on several aspects which will show the quality of the product. 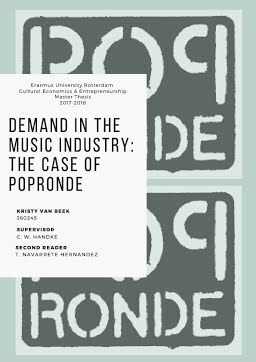 This research project makes an attempt to show how Popronde, a travelling showcase festival in the Netherlands, is one of those institutions that plays an important role in the formation of demand in the Dutch music industry. Even more specific, the media attention that (not for every band though) comes with Popronde, is determining in demand formation in the Dutch music industry. This quantitative research answers two questions, namely (1) ‘how does participating in the showcase festival Popronde influence the demand for live performances expressed by bookers of venues?’ and (2) ‘how does media endorsement during Popronde influence the demand for live performances expressed by bookers of venues?’ The main findings show that participating in Popronde does not increase the demand for every band or artist. The data shows differences between the group of participants. However, participating in Popronde and receiving media endorsement will cause an increase in the amount of shows, as well as the audience size. Next to that, the data also shows how the supply side if affected in this research. The data shows large differences in the long-term effect, which implies that some bands gain success, while others split up entirely. Keywords Cultural Economics, Cultural Entrepreneurship, Music Industry, Demand Uncertainty, Demand Formation, Certifiers, Quality, Signaling, Popronde.